Moral Angels Volunteers held their first “Kopi Roti Session 2017” on 22-04-2017 (Saturday). On this bright and lovely “Spring” afternoon Brother Song met up with Christina, Rico, Susan and Alice (Susan’s friend) to collect the chwee kueh at Ang Mo Kio Ave 10 hawker centre. 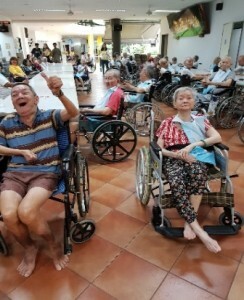 We next proceed to collect the siew mai at “Tanjong Rhu Pau” and reach “Moral Home for The Aged Sick” at about 1.45pm. 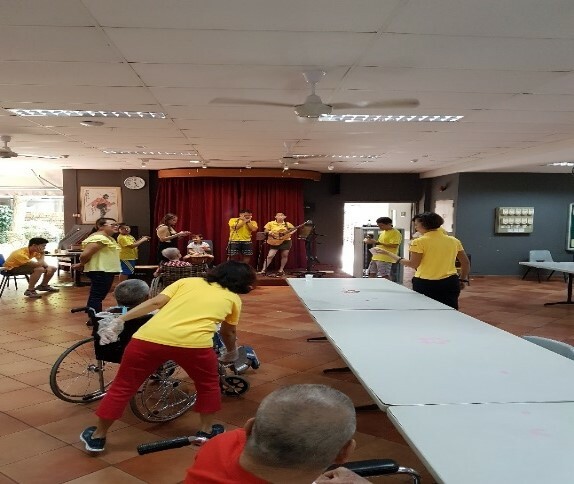 Sam arrived with soya milk and Adelene was kind to fetch Mr Lee, Mr Cheong and Mdm Tan, our invited guest from Thye Hua Kwan Moral Charities @ Indus Moral CARE and our Susan also invited her friend Alice to support our karaoke too. When the event started at 3pm, the canteen area were packed with our Ah Gong & Ah Mah. As usual, our all hardworking F&B team, Rico, Christina, Susan, Vivian, Doris, Ping Sing, Joyce, the young volunteer kakis all spring up to help to prepare the snacks. At 3.15pm, we begin with serving MH residences, Chwee kueh, siew mai and soya bean drink. The snack were the right choice, Ah Gong & Ah Mah just finished the snack in no time. There was a residence who had requested for 3 serving of soya bean drinks, till the nurse had to refrain him from over drinking. 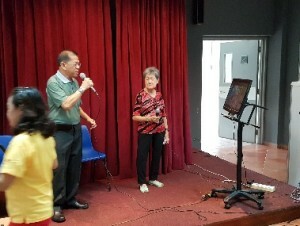 After the snacks being served, Stuart, Hui Quan & YiQi warm up with singing. Next we invited Mr Cheong to perform the Cantonese karaoke, followed Mr Lee who picked his all time favourite Hokkien songs and Mdm Lee the mandarin songs. 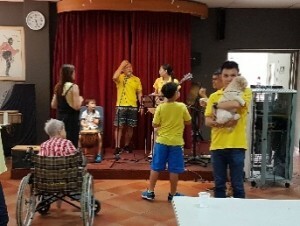 The 3 singers seems to be well prepared and chosen as each had selected Mandarin, Hokkien & Cantonese to entertain the residences. Next in the number was Alice who sang modern, cha cha piece. Our dear Susan was so sporting, where she dance cha cha on stage. On the audience side, our dear Robert and aunty Angel had “CHOPE the circles seat” to watch attentively to the performers. The audience love the singing group, as many times, we can see Ah Ma humming along, aunty Angel and Robert gave few thumbs up to encourage the singers. Also can hear from the background shouting “ encore, encore”…I am one of them…. One of Moral Home residence Mr Sim also performed 2 songs that had rocked the hall with his strong vocal tune. At 4.15pm, YiQi, Hui Quan, including Rico who sang and dance to our residences upstairs. I greatly appreciate YiQi who informed me her intention to bring cheers to our less mobile and bedridden residences too. Time really flies, its almost 4.45pm and time for dinner. Hui Quan started the game session; Name the songs or Singers. As usual, the objectives of games is to bring cheers to the residences with special gifts contributed by our Brother Song. This time, Brother Song had contributed more than 30 bottles of Bird Nest to reward our lovely Ah Gong & Mah. 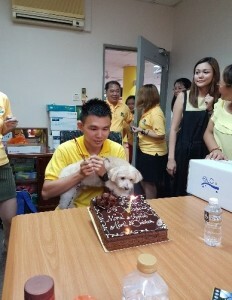 The grand finale came a surprise to Ah Kiat, where we celebrated his Birthday with song and cake. This Kopi Roti session was blessed with support from The Ngee Ann Polytehnic students who help to take our video, photos. Mr Lee, Cheong, Mdm Lim, Alice, Mr Sim …. and Susan who sang and perform to us. Many many thanks to our own team Stuart/Doris & family, YiQi, Hui Quan, Ah Kiat, Lucas & Kayden– the drummer, Giselle-the pretty girl. 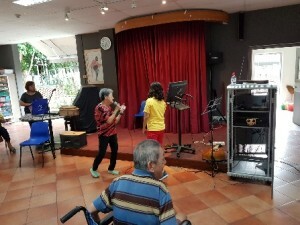 Our Joy team, James, Meng Huat, Rico, Christina, Aunty Vivian, Raymond, Ping Sing/ Desmond & family, Stella, Jin Xiong–the Master of Ceremony, Willit-where we missed her laughter, Joyce & Kayden (Joyce’s son) kind boy who help to massage my back, Brother Song-all time generous man. Kudos must also go to Sam for inviting and engaging the 3 elderly singers from Thye Hua Kwan Moral Charities who came and brighten the day for the elderlies of Moral Home for The Aged Sick. The event end with briefing by Raymond on our next outing on 27 May 2017 with students from Singapore Sports School.